The term ‘angiokeratoma corporis diffusum’ (ACD) has been used synonymously with Anderson-Fabry disease since its original description. Since the availability of effective therapy, the drive to identify patients has increased. As a result, we are becoming more aware of a broader spectrum in the cutaneous and systemic phenotype of the condition. Not all patients have widespread angiokeratomas. Macular (flat) angiomas without any overlying hyperkeratosis and papular- ‘cherry’ angiomas are also seen. Telangiectases may occur at sun exposed sites including the face and ‘V’ of the neck, more rarely they are present in unusual sites, such as flanks and elbow flexures. In addition to these cutaneous vascular lesions, skin signs include characteristic facial features, oedema and lymphoedema of the lower limbs, abnormalities of sweating and Raynaud’s phenomenon. Skin signs are an obvious, outward manifestation of disease and as such are important signs for diagnosis. They represent a significant source of morbidity, have a recognised impact on self-esteem and quality of life, and should be treated appropriately. 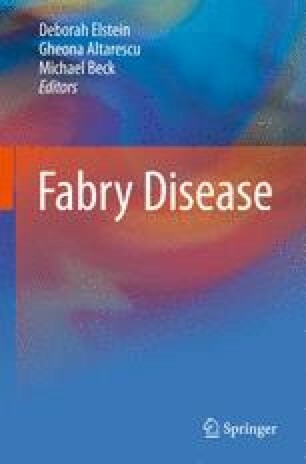 Of particular interest, is whether the cutaneous phenotype may be helpful not only in making the diagnosis of Fabry disease, but also in assessing or predicting overall disease severity. I would like to thank the patients for participating and allowing us to use their clinical photographs and Dr P Elliott for his helpful comments during the preparation of this manuscript.